Cambia staff are motivated and driven by a passion and desire to make an impact in the world; to make innovation systems more transparent and easier to navigate; to encourage and facilitate scientists in many parts of the world to work together; and to make sure that people know about, and can participate in, Cambia's work. It's a tall order, and our staff need their creative capacity fueled to keep their ideas percolating. 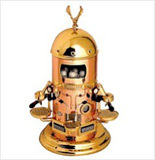 There's only one CEO for this job - our Chief Espresso Officer - the commercial grade Italian-made "Belle Epoque" by Elektra. Purchased for staff in 2005 by the real CEO (Richard Jefferson), the Elektra (fondly called "R2D2") keeps Cambia running smoothly. R2D2 was bought to say "job well done" in an exceptionally busy period in 2005 when staff successfully created and publicised a new method of gene transfer called TransBacter (an unencumbered alternative to the heavily patented Agrobacterium) and launched it under the first Biological Open Source license, on the first prototype BioForge, a distributive collaboration initiative for scientists. Icing on the cake was the publication of these achievements in the journal Nature and significant enhancements to the Patent Lens for determining status of patents and patent applications in many countries. Today, R2D2 serves as the meeting place of Cambia where staff regularly congregate to make great espresso, exchange and debate new ideas or catch up for a friendly yarn.